What stands out to you in the image above? The amount of fray in the rope? The single strand holding things together? This rope can be a perfect metaphor for the world we are in right now. We can see that we are in difficult times. We can feel that we have a lot of things that are separating us, and that can be a difficult emotion to counter. However, in this image, we see that strand which is holding things together. For some, we can look at this and be counting down the days until things fall apart. Instead, we should be people who see that strand and can be filled with hope. This hope is focusing on the things that unite us. 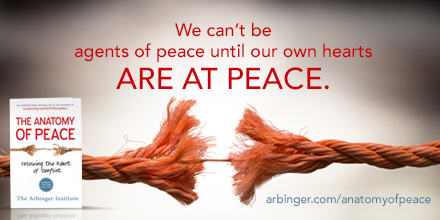 "The Anatomy of Peace" is a book that tries to get to the heart of why conflict happens. The heart of things is because our hearts are often at war, rather than at peace. We treat people as issues and we listen to people so we can respond opposed to listen to understand. This book comes from the Arbinger Institute and is a resource that helps us understand the root causes of conflict in our homes, communities, and world. We recommend this book and we are providing a study guide so you can use it with your bookclub, workplace, faith community, or any group that you are a part of. You can purchase your book from major book retailers. You can find more information and a list of booksellers by clicking here.